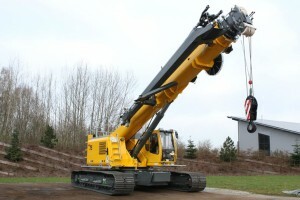 Crane manufacturers Sennebogen and Manitowoc have signed an agreement to produce a series of telescopic crawler cranes at the Straubing location in Lower Bavaria, Germany. The agreement is for the production of telescopic crawler cranes for the North and South American market. The crawlers will be produced by Sennebogen and sold using the Manitowoc Grove brand name, a company spokesperson said. The new models include the GHC55, GHC75, and GHC130 telescoping crawler cranes. The GHC series has a compact footprint, which provides excellent manoeuvrability on the job site, a spokesperson said. The GHC Series cranes are fully supported by Manitowoc Crane Care’s service network. A variety of attachments are available for the models, including an auger attachment and pole claw, ideal for companies working on power line projects. The Grove GHC55 has a 55 US ton (50 tonne) capacity and 30.4 m main boom length. The total crane length with boom retracted is 10.7 m long and crane retracted width is 3.5 m. It has an overall height of 3.2 m.
The Grove GHC75 has a 77 ton (70 tonne) capacity and 36 m main boom length. The total crane length with boom retracted is 13 m and crane retracted width is 3.2 m. It has an overall height of 3.2 m.
The Grove GHC130 has a 132 tone (120 tonne) capacity and 40.2 m main boom length. The total crane length with boom retracted measures just 15.3 m long and crane retracted width is 3.9 m wide. It has an overall height of 4 m. All three cranes feature Tier 4 final compliant Cummins engines. Manitowoc will offer services for maintenance, service, spare parts, and financing. The equivalent products from the Sennebogen product range (the Sennebogen 653, 673, and 6113) will not be offered in these sales regions. The contract was signed in November 2014, with production beginning in 2015.